Energy will be the next big thing in the sharing economy, as digital and technological advancements make it possible to share once-centralised services directly from peer to peer. Decentralised micro-grids can ensure better resiliency against climate disruption while enabling citizens to trade surplus of renewable electricity production with their neighbours. Increasing frequency and strength of floods, storms, and other extreme weather events are disrupting energy systems and causing mass power outages for urban residents. In response, decentralised energy systems that can disconnect from the traditional grid and operate autonomously are emerging to provide more resilience in the energy supply. Decentralised energy sharing is an opportunity space in which micro-grids play a key role, as they provide flexibility and improve the ability to respond to rapid fluctuations in the supply-demand balance. The rise of blockchain technology, which facilitates secure local trading of electricity on a decentralized grid, can further shape the opportunity to transform the power grid into a decentralised network, allowing households to trade electricity without a middleman. Products in this new decentralised energy market encompass solar panels, smart meters, and other smart devices and software to manage energy flows and ensure flexibility. Services in the opportunity space include solar storage community platforms, cloud platforms that enable energy sharing, and software to manage transactions. Another potential service in this opportunity space is connecting several micro-grids in a larger grid so the network will function as a virtual power plant, connecting sprawling networks of independent batteries, solar panels, and energy-efficient buildings and remotely controlling them with software and data systems. Blockchain and decentralized energy sharing have the potential to break down the distinction between producers and consumers. Historically, utilities have had a one-way relationship with bill payers, but the growing adoption of home-solar systems re-shapes this relationship. Consumers become ‘prosumers’ who generate their own electricity and either sell it back to the utility, or sell their excess electricity directly to their neighbours, effectively cutting out the utility. The worldwide market for community resiliency micro-grids is expected to expand from 162.9 million USD in 2015 to 1.4 billion USD by 2024. For the broader micro-grid market, revenue may reach 40 billion USD by 2020. An important demand driver is the rise of the energy literate consumer, the growing consumer segment that has a perspective beyond price. They are aware of and concerned about where their energy comes from. Combined with rising energy costs and declining costs of micro generation technology such as solar panels, small-scale wind turbines, and energy storage, these conscious consumers are driving governments and citizens to increase investment in a variety of distributed energy sources. One enabler of this opportunity space is the battery storage market. The battery market is marked by high-demand, and the manufacturing cost for batteries is on the decline, making it more accessible to consumers. 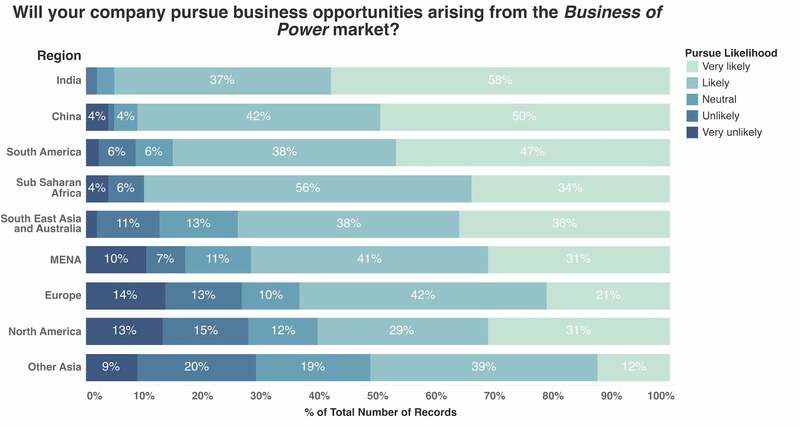 The business of power is a very popular market opportunity in Sub Saharan Africa as well as in the MENA region, while it is also rated highly by leaders in India and South America. The opportunity represents the market for delivering renewable energy via decentralized grids, by, for example, using blockchain technology. It is clear from the survey the market for decentralized energy can be expected to mature most rapidly in India. Indian leaders perceive all the ingredients for market growth, including technological and economical capacity, to be readily available in the Indian market. Another market to keep an eye on is Sub Saharan Africa, which may leapfrog into a green transition through decentralized power delivery, according to the survey. The survey also indicates leaders in Sub Saharan Africa are confident the technological capacity to grow a decentralized energy market is readily available in their region. Respondents from China and the MENA region are among the leaders most confident the opportunity will have a great impact on business. 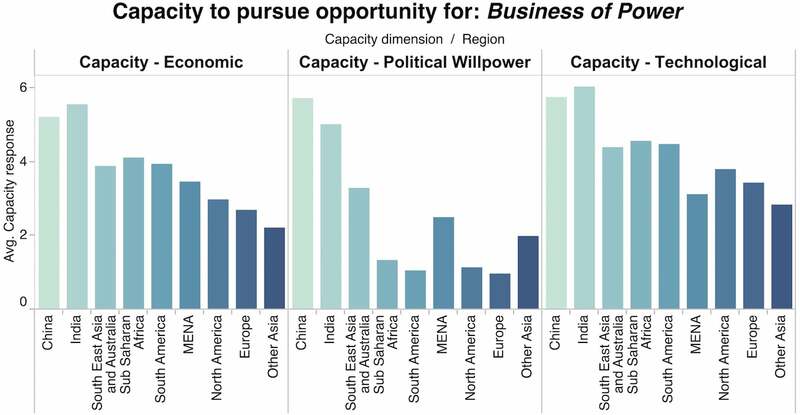 Additionally, the market opportunity embodies the strongest business case of all opportunities, according to Indian leaders. This indicates the Indian market for decentralized energy provision will mature rapidly. According to the 2016 survey, the service industry and the public sector expect this opportunity to provide the most positive impact on society, while the manufacturing and “other” sectors are most likely to pursue it. In addition, the survey indicates we can expect partnerships to form between civil society and business to accelerate the market for decentralized energy further, especially in India and in Sub Saharan Africa. In both regions, respondents expect business and civil society to be strong and active advocates for the decentralized energy market space. This market was surveyed globally in 2016 by more than 5500 leaders from both the public and private sectors. The survey was conducted in collaboration with the research company YouGov. The survey results were originally published in the Global Opportunity Report 2017.